In October 2013 I was fortunate to get an invite from Cisco to attend their ‘Internet of Things’ World Forum in Barcelona. The Internet of Things is going to herald the introduction of the fourth industrial revolution and Cisco, SAP, Oracle, GE and many other tech and industrial companies want to be part of this new and exciting sector. The presentations from the forum are freely available via the www.iotwf.com website and I would encourage you to download some of them as they provide some great insights into what is coming in the near future. Some of the subjects being discussed at the forum, especially in healthcare, would not have looked out of place in the 2003 Terminator 3 film, ‘The Rise of the Machines’, hence the title for this particular blog entry! I personally found the event to be one of the best conferences that I have attended in recent years and there were a lot of conceptual ideas discussed which gave plenty of food for thought. There were some great videos shown at the event and here is one example describing Oracle’s vision for an Internet of Things platform. One such idea, which for some reason I have not been able to forget since the conference, is the thought that any type of machine could potentially have its own avatar or Facebook style profile page. To put another way, in your personal life you may have an online profile such as Facebook or LinkedIn to keep in touch with both friends and work colleagues. What about if every machine connected to the internet had its own avatar or online profile as well? I thought this was quite an interesting concept, but what would it look like and how would it work? I like challenges such as this so I had to try and come up with a concept, using Facebook as a basic template as you will see below. The other reason that I am interested in this is from a B2B and supply chain point of view. Here at OpenText | GXS we offer a collaboration or rather community management platform called Active Community which allows companies to maintain a centralised database of contacts for all trading partners across a supply chain. If machines were somehow able to interact directly with the supply chain, either up or downstream then it could potentially help introduce a new set of operational benefits and efficiencies. The Internet of Things offers the potential to connect the physical and digital supply chains in a way that has not been possible before. But what if individual machines could somehow interact with users or vice versa, could a Facebook type of ‘asset management’ environment provide a neat way of managing the machine to machine communications across a supply chain? Even though the concept of the machine based avatar was discussed at the Forum, there was relatively little information offered as to how this could work. I am sure there are some conceptual ideas out there already, but I thought I would offer my own vision of how this could work. One of the discussion panels at the forum included a speaker from Caterpillar who said that every machine that leaves their factory includes a WiFi module so that it can be connected to the internet and information can be analysed and exchanged remotely when it is out in the field. So using this as an example I constructed the following mock-up of what a machine avatar and associated profile page could look like for a piece of Caterpillar equipment, in this case an excavator. Just remember that every machine connected to the internet would potentially have its own profile page such as the one shown below. So let me briefly describe the two key sections of the machine’s profile page and what they would do. At the top of the page you can see a few menu options including the number of users, along with internal and external machines that the excavator is connected to. A ‘user’ could be an operator of the excavator or it could be a service engineer for example, basically any person with an interest in the operation of the excavator would connect this way. 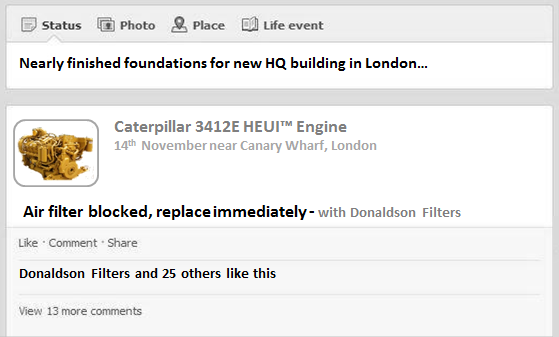 As with Facebook they would effectively ‘friend’ the machine to allow them to post status updates to the page. In addition, within the excavator there will be other machines such as the engine, pumps, electric motors, filtration systems etc and each of these could potentially have their own machine profile page as well. So as you click on the ‘Internal Machines’ link below it would list all the internal machines that have some form of information or profile page associated with it. Likewise the ‘External Machines’ link will list all the other pieces of Caterpillar equipment that the excavator is associated to, this could either be excavators of the same type, dumper trucks or other pieces of equipment that could be located on a particular construction site, eg cranes, lift systems etc. The media library may contain site photos or maintenance videos relating to the excavator. The Internet of Things will lead to a massive increase in data flowing across the internet and the area of Big Data is likely to be an important beneficiary of this. The ‘Health Check’ button shown above would basically take you to a performance/systems dashboard where you would be able to monitor the performance of the excavator and make any changes to the sub-systems, remotely of course, in order to make sure that the excavator is always performing well. Caterpillar themselves would also have access to this information so that they could monitor the performance of every excavator of this type that has ever been sold. This would certainly help alleviate any potential repair situations because ‘predictive maintenance’ would ensure that the down time of these excavators is kept to a minimum. 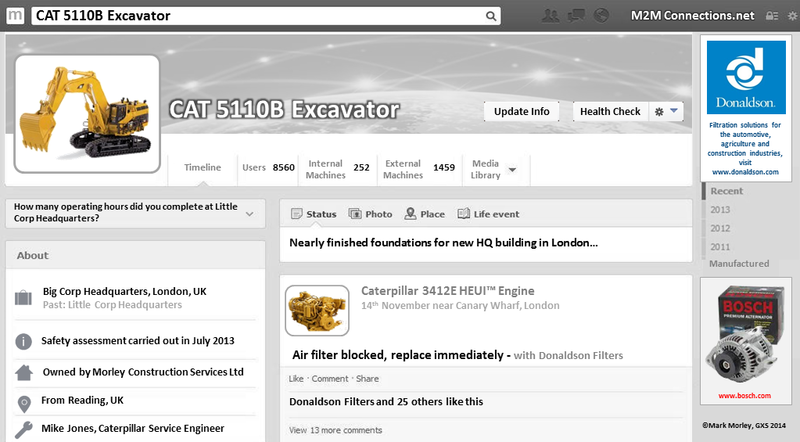 In the area of the profile page shown below, we can see that the operator of the excavator has posted an update about the status of a construction project, just a small example to show that there could still be human updates applied to the profile page! In addition just below you can see that the engine has provided an update too. From a supply chain perspective, this is where it starts to get interesting. The status update provided by the engine and posted to the timeline of the excavator’s web page could be one of say 25 pre-configured status updates that can be automatically sent out by a machine within the excavator. So in this example there is a problem with the air filter and one of the suppliers to this particular engine has been tagged in the post. Donaldson (a leading supplier of filtration solutions), as an example, would pick up this status via their own supplier page and they could take the necessary steps to ship a replacement filter to the construction site. So just to clarify, the engine has found a problem, it has located the source of the issue, posted an update to its profile page and automatically contacted a supplier for a replacement part. OK an extreme example, but I am willing to bet that in the next few years we will see this become a reality. Now as with Facebook, this website which for the purposes of this blog I have simply called M2MConnections.net, could even carry banner adverts from various suppliers to this particular excavator or indeed the construction vehicle industry as a whole. I have used Donaldson and Bosch as just two examples here, but hopefully you get the idea. As you can see a lot more effort needs to be put into flushing out what this type of machine based social network could look like. We are just entering the fourth industrial revolution and the focus so far has been on the subject of just getting machines connected to the internet. The next step is working out how to interact with the machines and what I have described via this blog starts to describe this and this then leads us to the area of Big Data and how the information can be utilised across both the enterprise and the associated supply chains. I have really only scraped the surface of this particular subject area and every aspect of the operation of today’s supply chains is likely to be impacted in some way by the Internet of Things, from logistics networks, warehouse and distribution centres through to improved monitoring of inventory levels in factories and retail stores. I think we are heading for exciting times! So I have discussed slow moving excavators in this blog, how about we speed up things a bit with a video from SAP. SAP sponsors the McLaren Formula One team. Their race cars have around 140 sensors fitted to the car and after each lap of a circuit a data burst of information from the sensors is sent to the pit wall. This information is then transmitted in real time to their factory in the UK where engineers can analyse the data and make strategic decisions in real time during the race. All of the data collected from the car is stored in a SAP HANA database where extensive analytics can be performed. For me this represents one of the fastest and most complex pieces of automotive engineering that is connected to the internet today. The question is will the car versus the driver have its own Facebook style fan page in the future? Not into Race Cars?, well how about one of the fastest yachts ever designed, courtesy of Oracle Racing who won the America’s Cup in 2013. Similar concept to McLaren’s race car where data from numerous sensors on the yacht is uploaded to an Oracle database and analysed in real time. Once again this represents the pinnacle of marine engineering. If you would like to obtain a high resolution version of the excavator profile page discussed in this blog, then please download from my Internet of Things board over on my Pinterest profile. 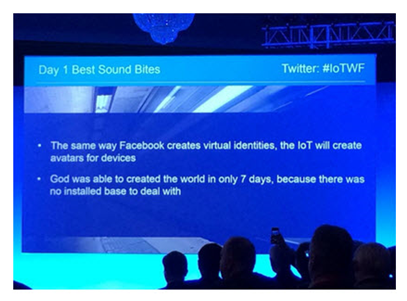 If you don’t have time to download the presentations from the IoTWF website then take a look at the media page on my Twitter profile where you will find a large selection of key slides from the presentations at the forum.